Northern Light Technologies is one of the largest manufacturers of innovative bright light and specialty lighting technology products. Established in 1989 by a team of engineers, the company has developed a full range of products to bring “light into your life”. Working with thousands of MDs in North America and in Europe including Germany, France, Netherlands, Sweden, Denmark and Norway, Northern Light Technologies has become widely recognized for its innovation, superior products, experience and customer service. In 1993, the Company co-founded and is still an active member of the Circadian Lighting Association, committed to maintaining high quality, safe and effective products with accurate performance specifications. Today, with ongoing product development, Northern Light Technologies is launching new and improved bright light products. The SLTBR (Society of Light Treatment and BioRhythms) is comprised of all the top winter blues and sleep disorder researchers. The SLTBR informs of the latest research results in the ever evolving field of light therapy. Northern Light Technologies has participated annually in their conferences for 25 years. 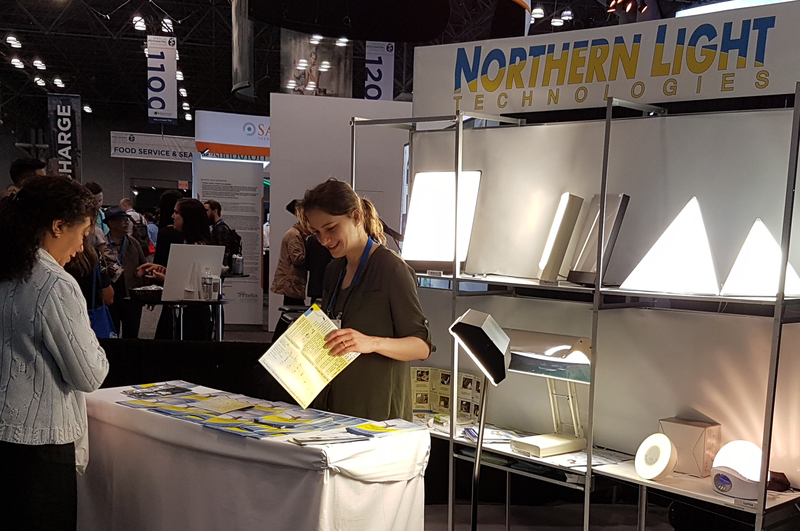 Northern Light Technologies exhibiting at the 2018 APA (American Psychiatric Association) in New York. NLT is happy to form partnerships with other companies that have similar goals. We distribute products from both Lumie and PEP (Physician Engineered Products) that meet our high quality standards. CET is an independent non-profit organisation that endorses our BOXelite OS. The Center is made up of a multidisciplinary team of eminent researchers and clinicians including experts in mental health who are committed to pooling their efforts toward the development and application of effective environmental therapies. Working in the light therapy field we are aware of the importance of mental health and community and are happy to help give back by participating in projects such as the Lightbrary Project organized by Robin Mazumder and Light 4 Hope which aims to make light therapy available in schools across Canada. Proceeds from the sales go towards a light for a northern school who can’t afford one.